Points Nécessaires : 1750 Veuillez noter que, pour l'instant, vous ne pouvez pas télécharger du contenu à partir de notre plate-forme directement sur un appareil mobile (téléphone, iPod, iPad, tablettes ...). Vous devez télécharger vos articles sur un PC ou un Mac, puis de les transférer sur votre appareil de façon normale. Nous travaillons à autoriser le téléchargement direct aux périphériques mobiles, mais ce n'est pas possible dans la version actuelle de la plate-forme. Désolé pour le dérangement! 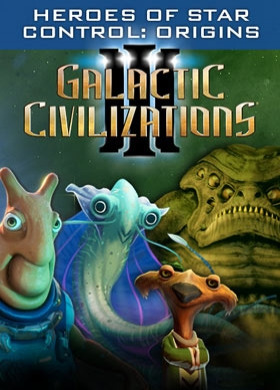 NOTICE: Requires the base game Galactic Civilizations III in order to play. Activation key must be used on a valid Steam account. Requires internet connection. About the gameGreetings, BEST FRIENDS. The Tywom - and other exciting alien species from the Star Control®: Origins™ universe - have come to Galactic Civilizations III! Each alien race brings a new depth of play with unique leaders,… ship designs, traits, music and more.The Star Control Heroes DLC pack introduces the Tywom, Mowlings, Mu’Kay, and Free Trandals into Galactic Civilizations III. All of the new major alien factions come equipped with a unique leader, ship designs, music, and traits that make sense for that race. Here are the new races you’ll be able to play with in Star Control: Heroes:Major Factions Tywom - Hello, best friends! These yellow slug-like aliens would like a hug. They’re slimy, and you don’t want to give them one, but still - it’s all they really want. The Tywom want to be friends with everyone, which makes them great diplomats, and their constant desire for approval gives them a bonus for any other factions who happen to love them. Mowlings - All hail the mighty Jeff! The Mowlings are small, bear-like creatures who worship a mysterious deity they call Jeff. Frankly, they’re a little lost without him, so they spend their time finding new ways to worship him. The Mowlings get a special Temple of Jeff improvement (one per planet) that grants bonuses to influence and approval, and in return Jeff orbits their planets protectively. Mu’Kay - Greetings, federation member! Founders of the Federation for Allied Species, the Mu’Kay are intelligent cephalopods who live entirely in aquatic environments. Their natural intelligence makes them excellent researchers, and their polite (if occasionally condescending) manner lends itself well to diplomacy. Unless you’re a fish. Then prepare to be eaten. Free Trandals - Cast off the shackles! The Free Trandals are the escaped faction of a race that has been enslaved by a malevolent AI known only as Overmind, who uses their bodies to advance its own nefarious purposes. Now, the Free Trandals work to free their brethren and rebuild their lost culture with what little they have left. Possessing a surprising capability (and healthy paranoia) for advanced technology, the Free Trandals are far from helpless both on and off the battlefield. Their warrior instincts may be long buried, but their ships, while few in number, are enormously effective against silicon and synthetic based life forms. Key Features 4 new major factions with unique leaders, ship designs, music, and traits Dozens of new ship parts inspired by Star Control: Origins for building and modifying your own ships Several new music tracks from Star Control: Origins New faction traits: Needy, Divine Guardian, Unshackled, Federation New ship designs, colors, and styles System Requirements Windows - Minimum Requires a 64-bit processor and operating system OS: 64-bit Windows 10 / 8.x / 7 Processor: 1.8 GHz Intel Core 2 Duo / AMD K10 Dual-Core Memory: 4 GB RAM Graphics: 512 MB DirectX 10.1 Video Card (AMD Radeon HD5x00 Series / Nvidia GeForce 500 Series / Intel HD 4000 or later) DirectX: Version 10 Network: Broadband Internet connection Storage: 12 GB available space Sound Card: DirectX Compatible Sound Card Windows - Recommended Requires a 64-bit processor and operating system OS: 64-bit Windows 10 / 8.x / 7 Processor: 2.3 GHz Intel Core i5 Processor or Equivalent Memory: 6 GB RAM Graphics: 1 GB DirectX 10.1 Video Card DirectX: Version 10 Network: Broadband Internet connection Storage: 15 GB available space Sound Card: DirectX Compatible Sound Card © Stardock Entertainment. Galactic Civilizations is a registered trademark of Stardock Entertainment. All rights reserved.